The PC Phone Recorder can capture all your important phone conversations on your computer, record them, and play them back anytime you need to. Because the PC Phone Recorder saves your phone calls onto your PC computer, you can even email your conversations and listen to them in your office, your home, and anywhere your email is sent to!!! The PC Phone Recorder lets you record your phone calls from your single line phone onto your computer by plugging into a USB port on your computer. PC Phone Recorders make saving phone calls very easy for single line phone recording. How it works: The PC Phone Recorder activates automatically by RECORDING EVERY INCOMING AND OUTGOING PHONE CALL ONTO THE HARD DRIVE OF YOUR COMPUTER. How our PC Phone Recorder is different from other PC Phone Recorders: Our system is a USB Phone Recorder. Most PC phone recorders on the internet do not use a USB connector, making them slightly difficult to install and use. Ease of use: When you try using a PC Phone Recorder, you don’t want to have to find a computer wiz to connect it for you. 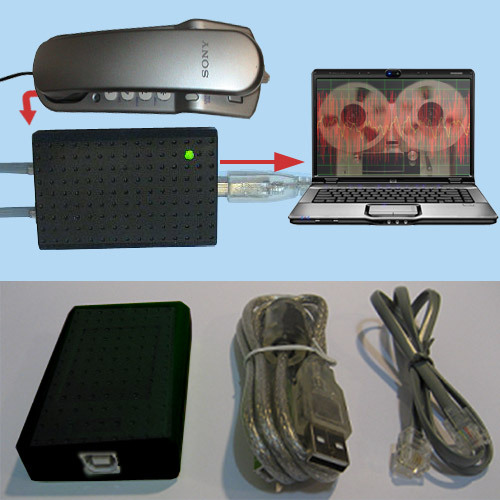 You want a plug and play PC Phone Recorder that is simple to operate. Step 3: Plug the supplied phone cable from the PC Phone Recorder into your phone plug that you unplugged from step 1. Step 4: Plug the USB cable into the front of the PC Phone Recorder. Step 5: You are done! The PC Phone Recorder is small, the size of a Credit Card in length and width so it fits easily by your phone line. Can store recorded files onto your PC's hard drive. The PC Phone Recorder can also store recorded files to your network drive, CD or FTP Site. The PC Phone Recorder can instantly playback a call through your computers' speakers. You can add notes to recorded files. No need for tapes, memory cards, or batteries. The PC Phone Recorder is maintenance free. As a USB Phone Recorder, the system efficiently records both sides of your phone calls so you can store what you say and what the caller says to you. Lets you automatically or manually record calls so you can decide which ones you want to save. Compresses sound files so the files stored on your computer do not take up much space on your hard drive. Q: What kind of phones will the PC Phone Recorder work with? A: The PC Phone Recorder will work on single line analog phones. If your cordless phone is a single line phone, or if you have an answering machine base with a corded or cordless phone, you will be able to record your phone calls. Q: Can the PC Phone Recorder work on any phone? A: The PC Phone Recorder works only on single single line phones. That means if you have a digital phone line or a PBX phone system found in most offices and hotels, you will not be able to use the PC Phone Recorder. Q: What kind of batteries does the PC Phone Recorder use? A: None. It operates on the power supply from your PC computer. Q: Does the PC Phone Recorder make any noises or sounds on the phone line during a call? A: No. There are no interruptions, clicks, or beeps. Just silent, non-disturbing phone recording. Q: What can be recorded? A: Record telephone conversations that are incoming or outgoing.